Today we are preparing for upcoming Thanksgiving festivities and I am so looking forward to slowing down and just enjoying time with family. 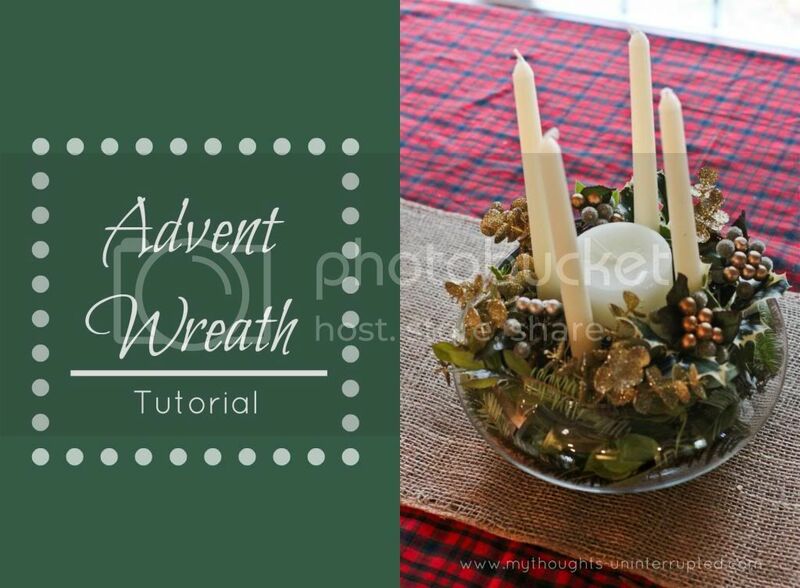 I wanted to make sure to share this tutorial with you before things got too hectic in case you were planning on celebrating advent this year. I hope you and yours have a wonderful Thanksgiving! As I packed away Christmas last year, I was thinking about what I wanted to do differently the next year. I knew that Christmas would be even more exciting for Ethan as a three year old and that Santa and all the other glittery things would really be grabbing his attention. Our main goal as a family is to keep Christmas Christ focused and one of the ways I hope to instill that is through a family advent wreath. I grew up in the Methodist church where we celebrated advent on the Sundays leading up to Christmas. 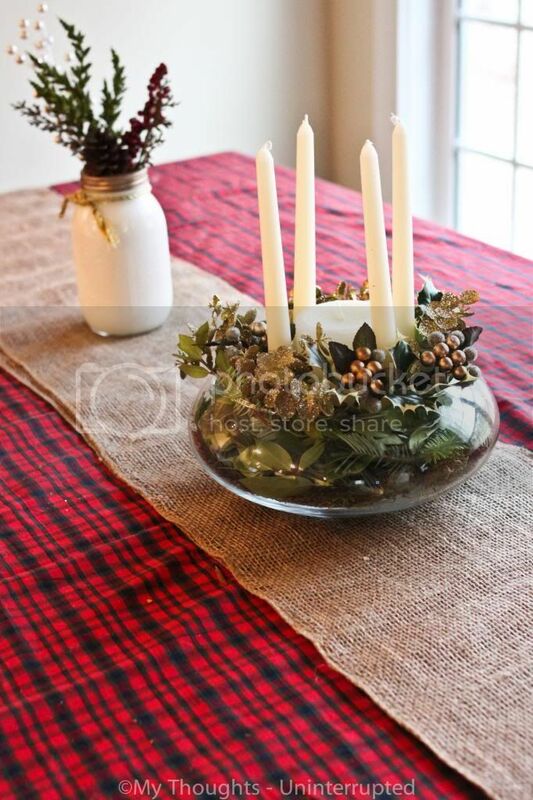 We never had an advent wreath within my home growing up, but I love the idea of doing this with our family now. This is our first year celebrating advent within our home and I'm looking forward to what takes place and how it will evolve over the years to come. This year we plan on doing a short biblical reading every night at dinner and talking to Ethan about what Christmas is really all about. 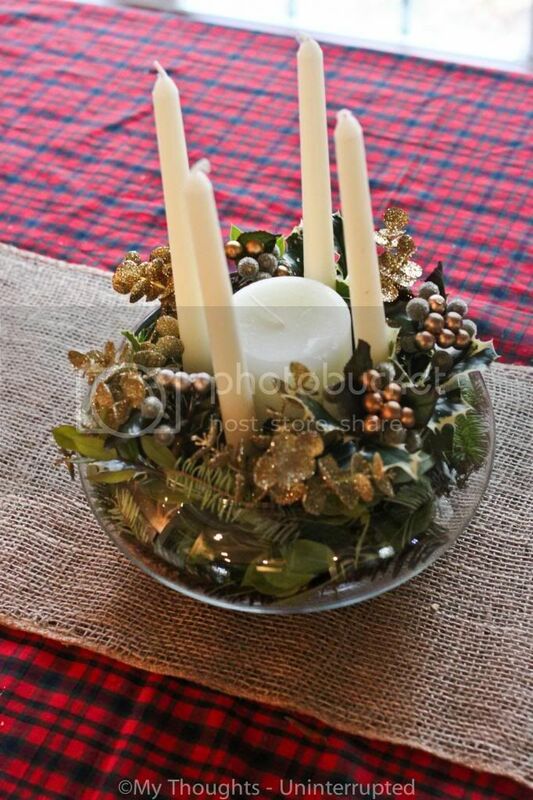 There are many beautiful ways to celebrate advent with your family depending on the age. I searched the internet for a reading guide hopefully aimed towards young children and came across this lovely plan from Part of the Main. She uses the Playmobil Nativity Set along with her readings which I think is a fantastic idea. We do not have this particular set, but I think next year that will be a must. I bought my supplies at Hobby Lobby which regularly has items at 1/2 price. The greenery came from my backyard and I also used some floral picks I had leftover that are not pictured here. The traditional advent candle colors are purple and pink. I chose all off white solely so it would match the rest of my decor. If you want the traditional colors they do sell them at Hobby Lobby as well as a group. The 5th candle is optional. It is the Christ candle that is lit Christmas day. Step One: Create your layout. Arrange your candles on the florist foam. Once you have them spaced the way you like, put a little pressure on them and wiggle them down into the foam to create a hole. 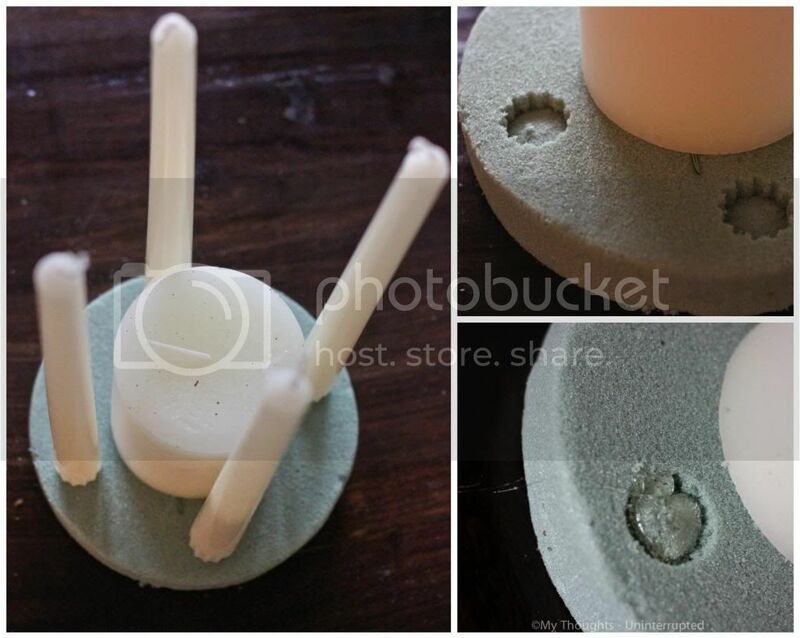 Remove the candles, fill the holes with hot glue and then place your candles back in. 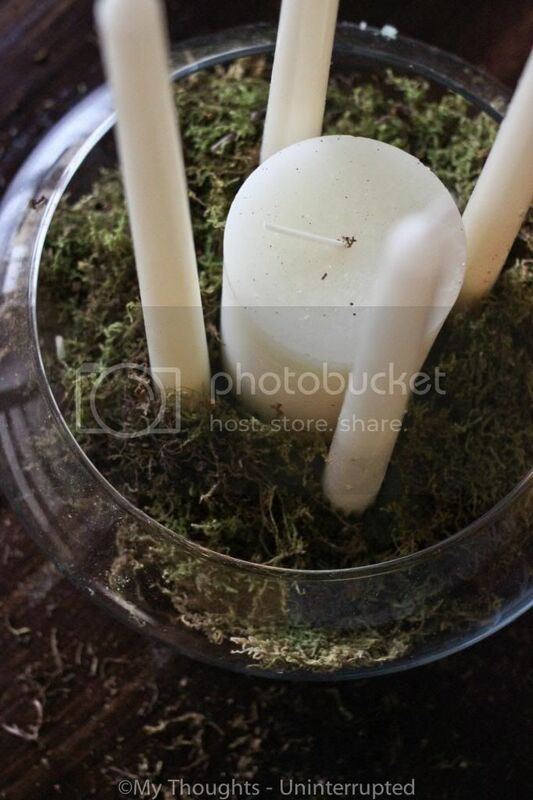 I did not do this procedure with the center candle since it is stable on its own. Carefully place the foam and candle piece into the bowl. I used moss since I already had it laying around. You could use a variety of different materials or possibly get away with nothing if you have enough filler. I just don't like to see any foam peeking through. 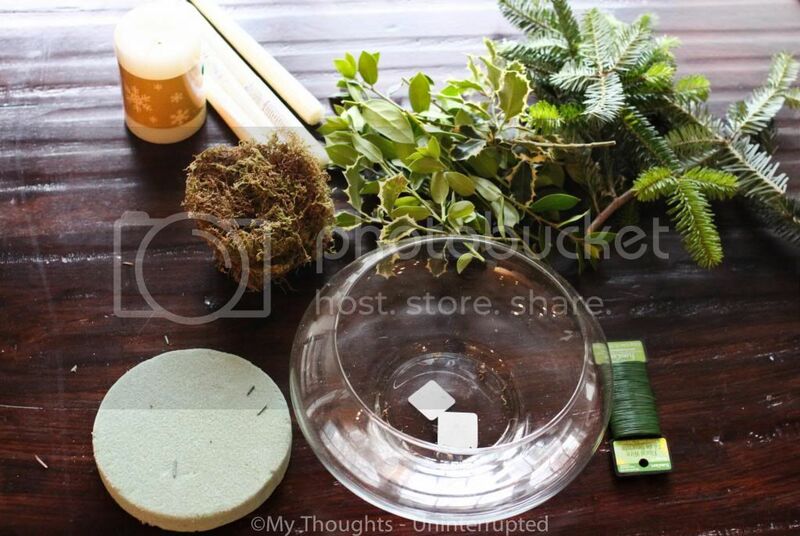 Step 3: Create your greenery bundles. I like using a variety of textures and thankfully we have several in my backyard. 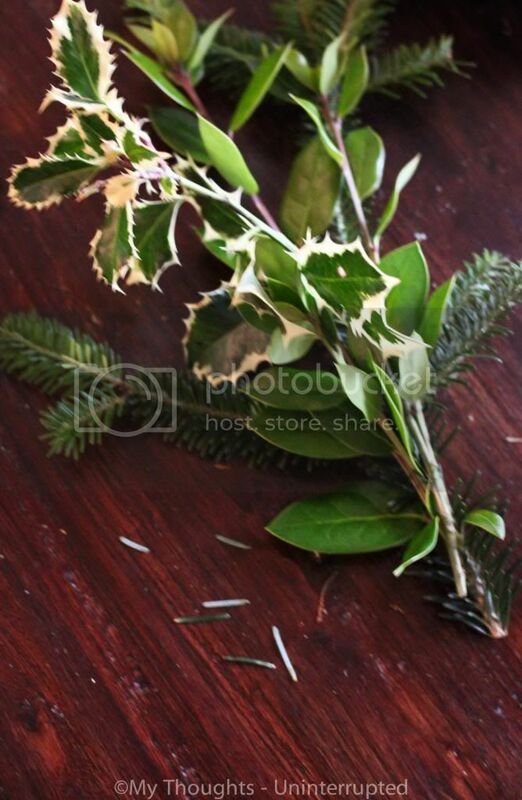 I used a little of the Christmas tree, a few branches of a shrub and some of a variegated holly tree. I made three bundles using florist wire to keep everything together. Step 4: Place the bundles in the bowl. This step is pretty self explanatory ;). I regretted using the holly around this point as it is extremely pokey. This is one Christmas decoration that has it's own self defense mechanisms, which will probably come in handy with the toddler about. Step 5: Jazz it up with some floral picks. You could have stopped at Step 4, but then you would miss out on the glitter. Something about Christmas just screams glitter so I couldn't resist. I just placed a few floral picks around to cover up any remaining holes. And that is it! How does your family celebrate advent? Do you have any favorite reading guides you use? Thanks for reminding me. I have an advent wreath. Will get it out tomorrow. Stocked up on three purple and one pink candle last year. Would have sat there until way too late. Thanks for this post. 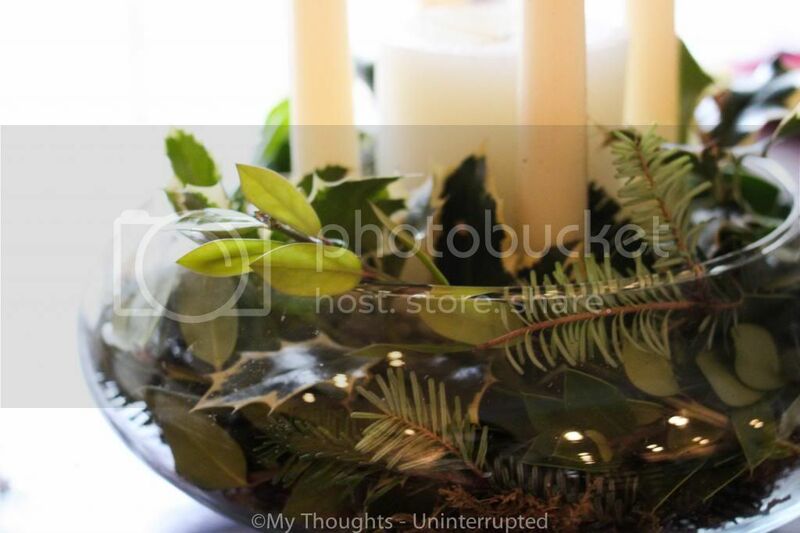 I really wanted to make an Advent wreath this year, and I really love what you created. I already have the perfect bowl, so off I go to get the rest of the necessities! Thank you!